. M I N U S I N D U S T R I E S .: Make It! I am very excited to announce that I'll be at this years Make It! I am so happy to be a part of it! This will definitely be my biggest show to date! This is a great opportunity to see what I've been up to and to start, finnish or continue your Christmas shopping! You can find all the details, and even save a little money, below! Alberta's independent art, fashion & craft extravaganza is back for 4 days!! Mark your calendar Nov 22, 23, 24 & 25! 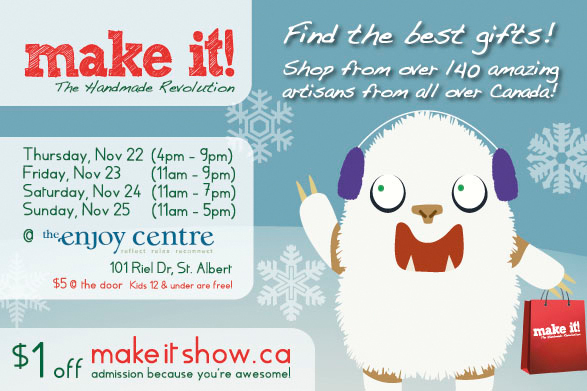 Find the best gifts at the largest Make It! ever! Shop for one-of-a-kind handmade items from over 140 of Canada’s hottest urban artisans and designers! [INCLUDING ME!] There will be something for everyone from fashion, accessories, art, jewelry, baby items and home decor!